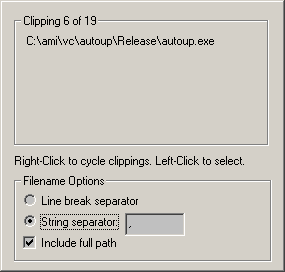 Pasteurizer is a utility that enhances the Windows clipboard. It supports pasting multiple texts, as well as the ability to copy & paste files from Explorer as text paths. In addition it provides some basic computer info, such as host name, IP address and free drive space. To install Pasteurizer, Double-Click the setup file. This will start a Setup Wizard that will guide you through the simple installation process. To uninstall Pasteurizer, select Uninstall from the Pasteurizer Start Menu group, if you selected this option during installation, or run Uninstall from the installation folder. Please write in with any bugs, suggestions, fixes, contributions, or just to drop a good word and let me know you've found Pasteurizer useful and you'd like it to keep being maintained.